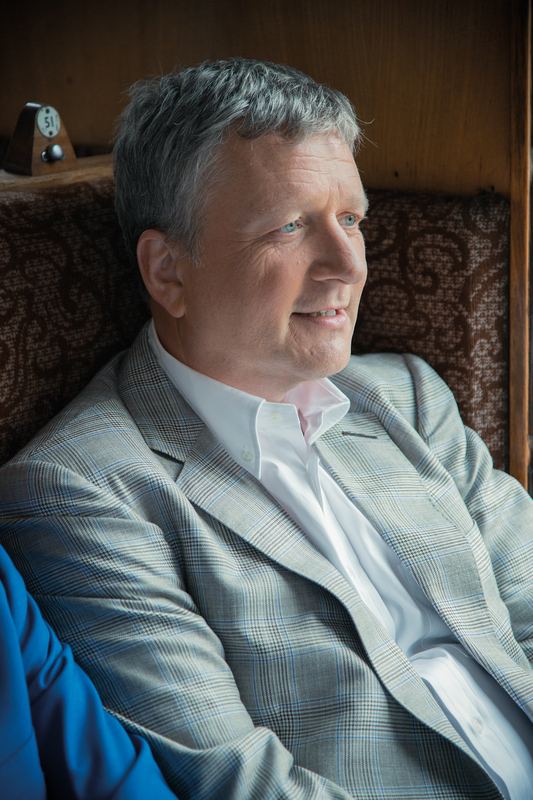 Glenn Tilbrook’s clearly not one for putting his feet up at home. Barely off the plane a few days after a major US tour with Squeeze, he’s already on the road again. What’s more, he’s fielding calls from the likes of me, so I start by thanking him for coming to the phone, somehow managing to avoid jetlag, and not falling asleep in his dinner. But I’m guessing he’s used to this jet-set lifestyle after all these years. After another major tour of the United States with his main band, is it fair to say America still loves Squeeze? And have they all been weaned on Squeeze? Chances are that you know this, but the Squeeze story started way back in 1974 in Deptford, South-East London, when Glenn answered an advert in a sweet-shop window for a guitarist for a band (although there was no band at the time), placed there by near-neighbour Chris Difford. An esteemed songwriting partnership was soon established, the first release following three years later, the Packet of Three EP. Major success followed, for a band also including Jools Holland and Paul Carrack at key times of the journey, and early singles Cool for Cats and Up the Junction were only kept off the top spot in the UK charts in 1979 by Art Garfunkel’s Bright Eyes and Tubeway Army’s Are Friends Electric? respectively. 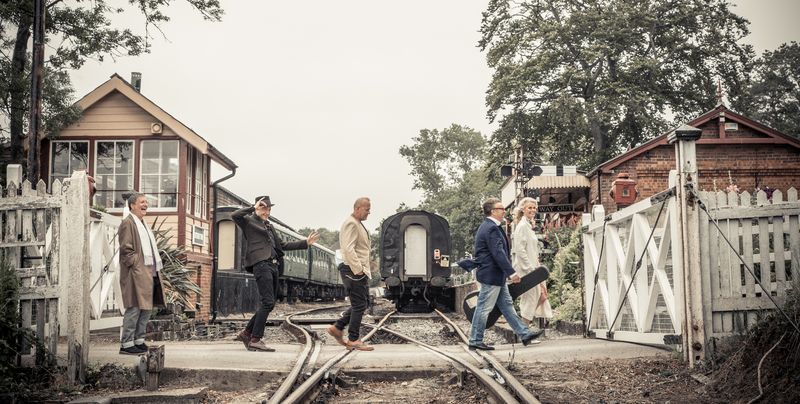 Altogether, the band released 12 studio albums between 1978 and 1998, enjoying a string of hits and major success, with just one three-year break in that period – which included 1984’s Difford and Tilbrook album, the two main songwriters going it on their own for the first time. Something of a hiatus followed a 1999 split, but the band reformed in 2007, a touring version of Squeeze continuing periodically in some form or other ever since. 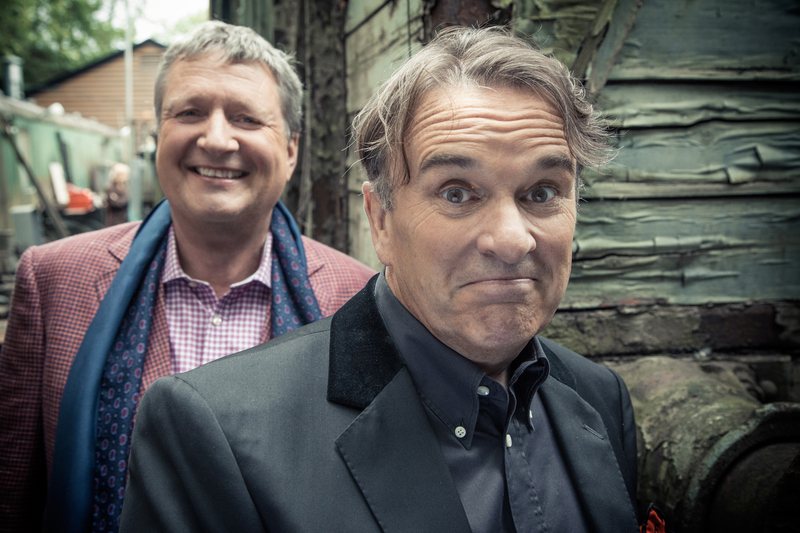 Yet during that later period Messrs Difford and Tilbrook forged solo careers, with Glenn’s most recent album his fourth, 2014’s Happy Ending. After that he went out on the road for his At Odds Couple UK and US acoustic tours alongside his long-time Squeeze collaborator. 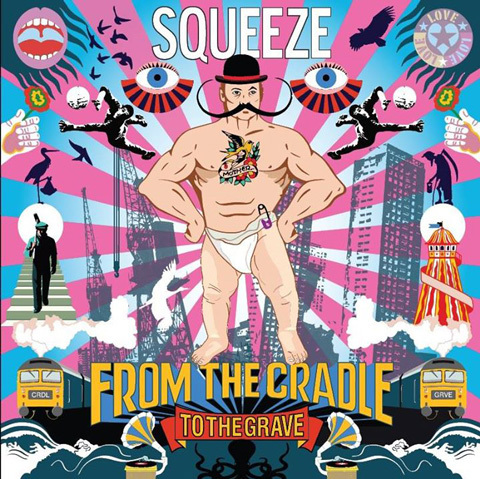 And then, last year, Glenn and Chris wrote Squeeze’s first album of new material in 17 years, Cradle to the Grave, initially for BBC TV comedy-drama Cradle to Grave, inspired by the memoirs of their friend Danny Baker. It proved a glorious return too, was met with rave reviews, and entered the UK album chart at number 12, the band embarking on a sell–out tour across the UK, including a memorable date I made it to at Liverpool’s Philharmonic Hall as well as one closer to their own patch at London’s Royal Albert Hall. That brings us on to that recent US tour, a continuation of their promotion of Cradle to the Grave. Yet now it turns out that Glenn’s at it again, guitar in hand, for his latest solo venture, the Best of Times tour, involving 36 dates – from Weston-Super-Mare’s St Paul’s Church on October 25th right through to Cardiff’s The Globe on December 18th. For those who haven’t kept up with his solo career, the tour title comes from the name of the lead track on his 2009 solo LP Pandemonium Ensues. And if you don’t know Best of Times, I recommend a listen to a song about dad-of-four Glenn’s family life, which offers proof that Chris’ lyrical expertise has brushed off on his old mate in recent years. So what does his better half – Glenn’s manager and missus, Suzanne – think of this latest disappearing trick? There are no Fluffers (Glenn’s backing band) this time. Did Glenn think he’d better give those who play in both of his bands some time off? Will he be getting his ‘big bus’ out again – his motor home – to mark the occasion? 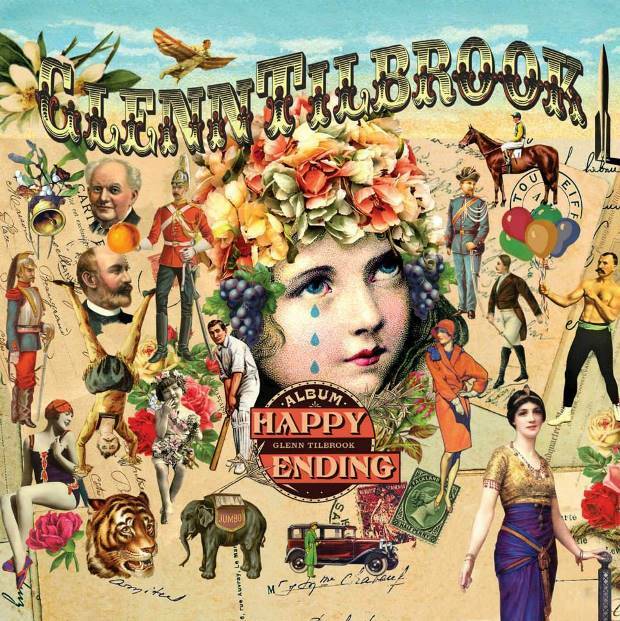 It’s been two years since Glenn’s last recorded offering, the rightly well-received Happy Ending. I realise he’s been extremely busy of late, but is the next solo album on its way? That’s great to hear, and I absolutely loved Cradle to the Grave, which seems to have been the reaction right across the board. He’s no doubt seen a lot of Chris recently, but have they any more At Odds Couple shows in the diary? Sorry, but I have to break in there. The Fall? Is he talking about Mark E. Smith’s cult indie band, the John Peel favourites? Or does he mean autumn? He’s clearly been in America a long time. I understand that a second series of Cradle to Grave has been commissioned by the BBC. Will Glenn be writing more songs for that? I also asked Glenn if his ears were burning the previous day, when I was talking about him to his good friend Dennis Greaves, front-man of Nine Below Zero (with that feature/ interview coming to this site very soon). I’m certainly enjoying their new album, 13 Shades of Blue. That album was recorded at Glenn’s 45RPM studio in Charlton, and includes a nice bit of sitar on one track, played by the fella who just happens to own the joint. 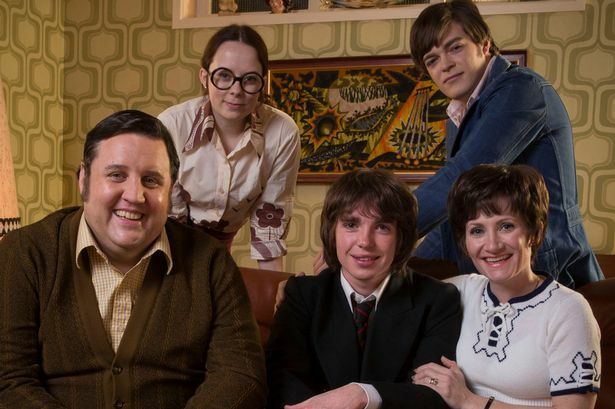 Baker Bunch: Danny Baker’s fictional family in Cradle to Grave, for which Squeeze wrote the music. Top row – Alice Sykes and Frankie Wilson. Front row – Peter Kay, Laurie Kynaston, Lucy Speed (Photo: BBC). Are you a bit like Paul Weller in that respect – picking up odd instruments to have a play when you’ve got guests in your studio? “Yeah. I’m not obsessed but I continually buy different things with the thought that I’ll use them and it will bring out something different. The best recent example of that is me using ukulele on Cradle to the Grave. I’d never have written that tune without a ukulele. Last time I talked to Glenn was part of a snatched conversation in a meet’n’greet while getting a hot-off-the-presses live CD from that night signed by the band after a Squeeze show, a year ago at Liverpool’s Philharmonic Hall. I seem to recall Glenn coming off stage a bit sharpish, following early technical difficulties. He was soon back on the horse that evening though, and ultimately that drama just added to a great show. 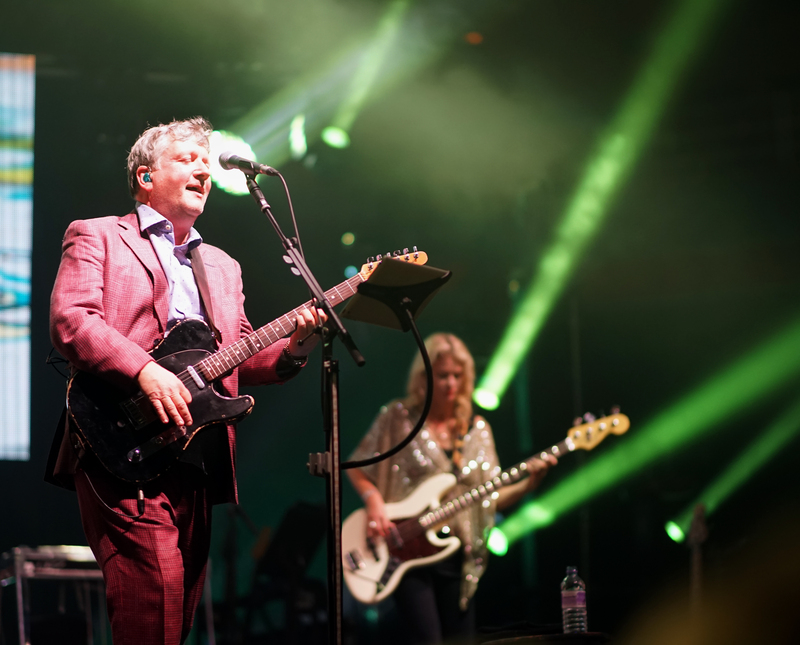 Incidentally, I tell him, when it comes to travelling arrangements for Squeeze, I now see them as they were when they left the stage that night – the whole band following drummer Simon Hanson in a conga through the middle of the auditorium, at the end of Take Me I’m Yours. So, did they follow Simon down to the road to the Albert Dock then board a liner to America that night? Interview-wise, it’s been three years since we last spoke, before a December 2013 solo show at Preston’s 53 Degrees, with Leslie Mendelson supporting. I remind him that he was getting over a heavy cold that night. Is he feeling fit for this tour? I hate to mention it, but Glenn hits the Big 60 next year. Does that change anything? Was Chris Difford delivering new lyrics under the side-door of Glenn’s motorhome between shows in America? That said, I got the impression from talking to Chris last August that it’s not as defined as it once was – Glenn’s turned his hand successfully to writing lyrics, as has Chris to melodies. Chris also mentioned at the time how he was pretty close to finishing his autobiography, tentatively titled I Never Thought It Would Happen. Is he there yet? Getting back to Danny Baker, did reading his 2012 Going to Sea in a Sieve autobiography inspire Glenn to have a go at writing one himself? Is that – he adds, tongue-in-cheek – so he can put the previous versions by other band members right, maybe? I put it to Glenn that the band all seem particularly chuffed with the reaction to the last LP. And – without being rude – it kind of made up for their previous swansong, 1998’s Domino, as I might have mentioned in my own review (with a link here). I suggested at the time – when there were concerns that it may have been their last as a band – that hopefully it was not so much an epitaph as a renewal of vows. Was I right with my wishful thinking there? There have been well-documented fall-outs in the past. I guess they’re easier characters to get on with these days, or at least know when to step back and not antagonise each other. Does that come with age and maturity? Finally, with the final track of Happy Ending playing in my head (and when it gets in my head, it’s difficult to shift), a music hall style singalong Glenn was taught as a lad by his Grandad, on his knee, I’m guessing that although winter’s fast approaching, there will be ice creams for sale throughout this tour. So, if that’s the case, how big will they be? For this website’s interview with Chris Difford, from August 2015, head here. 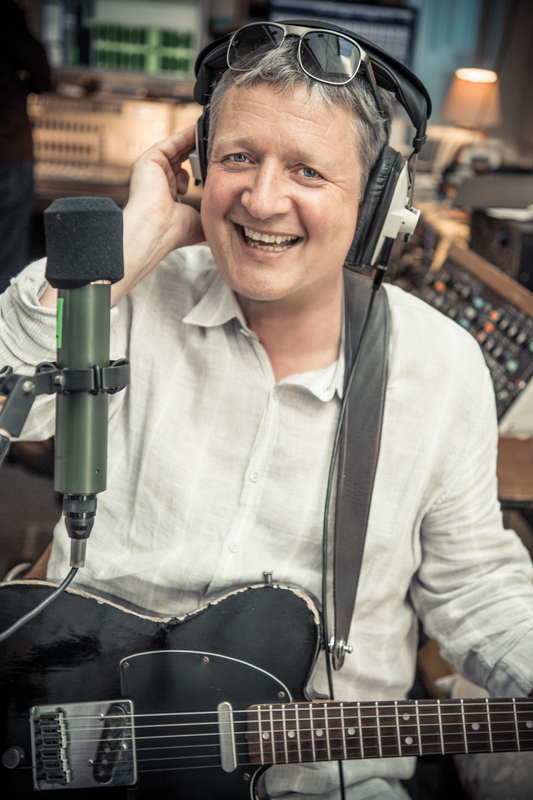 And for my previous interview with Glenn Tilbrook, from December 2013, try this link. Alternatively, just type in ‘Squeeze’ in the search column (towards the top of this page, to the right) and feast your eyes on a few other options. Glenn Tilbrook will be supported by Steve Smith, of Grammy award-winning electronica act Dirty Vegas, throughout this tour, including a trip to Burnley Mechanics this Friday, November 4, with tickets £16/£15 discounts, plus £2 per ticket if booked online. For more details call 01282 664 400 or head here. For full details of the Happy Ending tour dates and all the latest from Glenn, try here. And for all things Squeeze, try their official website, follow them via Facebook and Twitter, and check out Facebook’s packetofthree page. This entry was posted in Books Films, TV & Radio, Music and tagged Best of Times, Chris Difford, Cradle to Grave, Cradle to the Grave, Danny Baker, George Harrison, Glenn Tilbrook, Happy Ending, Liverpool Philharmonic, Lucy Shaw, nine Below Zero, Simon Hanson, Squeeze, Stephen Large, The Fluffers. Bookmark the permalink.